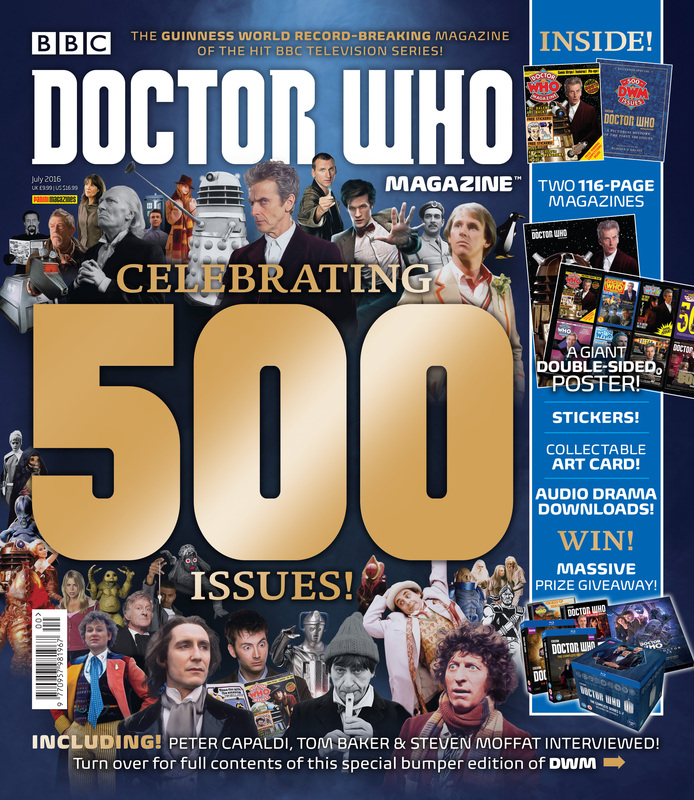 Home Doctor Who Doctor Who Magazine Celebrates 500th Issue – Out Now! 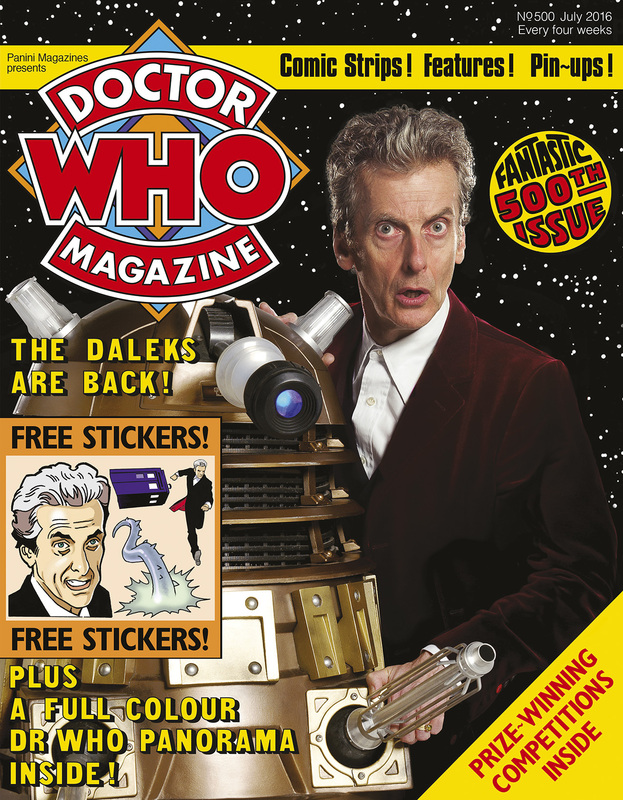 Doctor Who Magazine Celebrates 500th Issue – Out Now! It’s now officially the longest running TV tie-in magazine of all time, and Doctor Who Magazine is celebrating in style with a bumper-sized 500th issue! On sale today, readers can now pick up the biggest ever edition of the magazine to date, absolutely packed with special features and nods to the publication’s past. A lot has changed since the magazine began in October 1979 as Doctor Who Weekly, but its significance as a companion piece to the television show has remained constant, having featured contributions from showrunners Russell T Davies and Steven Moffat as well as every Doctor and companion over the years. A message to DWM readers from the Doctor’s new companion, actress Pearl Mackie. A letter from the Doctor himself! Fourth Doctor Tom Baker recalls the launch of DWM nearly 37 years ago in the first part of his self-proclaimed ‘last ever interview’. Peter Capaldi takes part in an exclusive photoshoot, recreating the cover for the very first issue, and explains how Doctor Who Magazine helped inform his portrayal of the Doctor. In an extensive interview, Doctor Who showrunner Steven Moffat talks candidly about why he’s decided that the next series will be his last, and reveals some details about the Doctor’s new companion. Writer Jonathan Morris takes a look back at how DWM has changed from its first issue, noting all the highs and lows along the way. A very special 20-page celebratory comic strip featuring the return of Maxwell Edison: The Stockbridge Showdown by Scott Gray, drawn by a host of guest artists including Dave Gibbons, John Ridgway, Dan McDaid, Roger Langridge, Adrian Salmon, John Ross, Martin Geraghty, David A Roach and Mike Collins. Back in 2001, four years before Doctor Who returned to TV, Mark Gatiss, Gareth Roberts and Clayton Hickman pitched their own version of the series to the BBC. For the first time, find out details of exactly what was planned, and see what graphic designer Bernard Lodge – creator of the iconic Doctor Who title sequences of the 1960s and 70s – would do with the show’s titles today. Peter Capaldi answers questions once put to the First Doctor, William Hartnell in a special ‘joint interview’! Gain a fascinating new insight into The Day of the Doctor, voted DWM readers’ all-time favourite Doctor Who story, in The Fact of Fiction. Full-page strips from the strange minds of Tim Quinn & Dicky Howett and Lew Stringer. A countdown of the Top 20 moments from the history of DWM’s comic strip. Behind the scenes of the Doctor Who mobile game Legacy – now featuring DWM characters Abslom Daak, Shayde and Frobisher! Author Jacqueline Rayner gets nostalgic in her regular column Relative Dimensions. Competitions to win HUGE prizes including hundreds of pounds’ worth of DVDs, Blu-rays, and audios, and a visit to see a Doctor Who audio drama being recorded! A BONUS 116-PAGE MAGAZINE looking back at the history of DWM, featuring every single cover, an introduction by Russell T Davies and commentary from the many editors who have steered the magazine over the years. The first in a series of collectable art cards, inspired by The Iron Legion, DWM’s first-ever comic strip. A massive double-sided poster featuring alternative versions of DWM 500’s cover. Plus a sticker sheet, a prize-winning quiz, News, Reviews, Coming Soon, the Watcher and LOTS of surprises! Well… what are you waiting for? The incredible 500th issue of Doctor Who Magazine is on sale right now! You can pick up a physical copy from WHSmith, newsagents, and supermarkets for £9.99 or you can purchase a digital edition from pocketmags.com for £6.99. Congratulations DWM on this amazing achievement, and here’s to the next 500 issues!